It was the first time I saw this big buck. 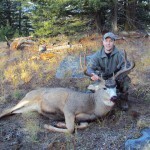 I shot him up past Sisters, Oregon around Three Creeks Lake, which is not my normal hunting spot, but i set up a tree stand because it was 30 minutes away from home so i would have a spot to hunt everyday after work. So one day after work me and my fiance and mom wanted to go hunting so we cruised up to my stand and they dropped me off and they took off so they could go find some deer. I was up in my stand for no more than a half an hour and here he came. I saw him from about 70 yards out. When i first saw him i swear my heart stopped beating. He finally got within 30 yards and i got the shot. I just barely got my bow back i was shaking so bad. I got a good shot and he only ran 20 yards. I thank God for the opportunity to hunt this beautiful trophy. This is a hunt i will definitely never forget. Description: It was the first time I saw this big buck. I shot him up past Sisters, Oregon around Three Creeks Lake, which is not my normal hunting spot, but i set up a tree stand because it was 30 minutes away from home so i would have a spot to hunt everyday after work. So one day after work me and my fiance and mom wanted to go hunting so we cruised up to my stand and they dropped me off and they took off so they could go find some deer. I was up in my stand for no more than a half an hour and here he came. I saw him from about 70 yards out. When i first saw him i swear my heart stopped beating. He finally got within 30 yards and i got the shot. I just barely got my bow back i was shaking so bad. I got a good shot and he only ran 20 yards. I thank God for the opportunity to hunt this beautiful trophy. This is a hunt i will definitely never forget. 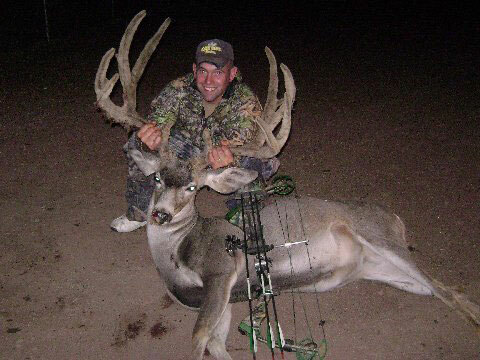 That is a buck of a lifetime, it’s good to see a fellow Oregonian hit it big. Way to go !! I’m so happy for you. In mulie hunting terms you won the lottery. Many thousands of hunters will spend their entire lives and never even see a buck of that caliber in the wild, let alone get within 30 yards of one. Congratulations on your buck AND your hunting skills. Someone must have taught you right and you used that knowledge to take a magnificent trophy. Good luck trying to top this buck. You may spend the rest of your life trying to out do this one. But I can’t think of a better way to spend the rest of my life. Congratulations again. hey looks like you got a beauty. do you always hunt in sneakers?